What time is it? Time for another giveaway! 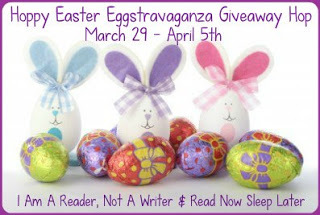 This one is the Hoppy Easter Eggstravaganza Giveaway Hop which is hosted by I Am A Reader, Not A Writer & Read Now Sleep Later. There are over one hundred bloggers offering giveaways in this hop and it runs from now until midnight on April 5th. Find the list of bloggers here. We are offering a YA paranormal eBook for one lucky reader. Our giveaway is open internationally and the winner will be gifted a Kindle edition of this book. You don't need to own a Kindle, there are apps for reading on your computer and such. Depends on the situation they were in. As long as there's some form of healing involved in the story. Sorta. I've only read a few with "broken" characters and so far those reads were okay. Mostly I do. It depends on how broken I guess. I like all kinds of stories, "broken" characters and all! Yes, it's interesting to see how 'broken' characters get 'mended'. Yes I do! I love it! It always gives the characters a real life persona to them and makes for a wonderful story! Yes I actually do:) thank you for the giveaway! Sort of, but I'm more interested in the whole prophecy thing. More often than not: yes. I do like books with broken characters, provided they step up and overcome the adversities. Thank you for participating in this fun hop. Hoppy Easter. Yes, it's always interesting seeing them overcome their tragedies. 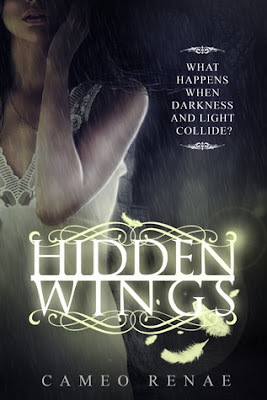 Thanks for the Awesome chance to win an ebook of Hidden! I do like books with broken characters, it is interesting to see the process they take to overcome their obstacles. thanks for the giveaway! Yes, because I like to see them put back together. Yeah I actually like broken characters. They're not bad and I think everyone is a little bit broken! Yes, depending on how broken or if there will be healing and redemption. Sometimes it really depends on the story. Yes, it makes things so much more interesting. Yes, I like stories featuring broken characters, especially when they overcome their problems. Yes but there has to be some healing and happiness or it gets too sad for me to read. Yes, I do. I like flawed characters and enjoy seeing their growth during the story.